This review is for the third volume of Durarara!! by Ryohgo Narita. The English edition was released by Yen Press in March 2016. There are currently five volumes out in English. 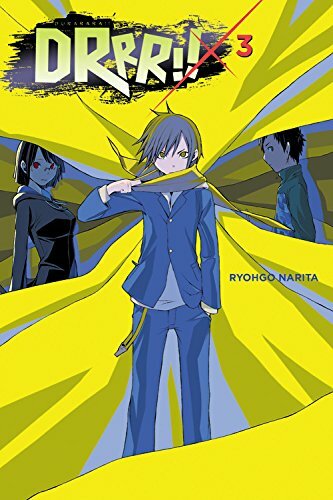 The series is completed with thirteen volumes in Japan, but a sequel series titled Durarara!! SH is currently releasing there (with four volumes out so far). Much like how the second volume of Durarara!! primarily focused on two characters (in that case, Anri and Shizuo), this third volume for the most part follows another two characters–this time we learn more about Kida and Celty. But of those two, the central story arc is definitely for Kida, who gets to stand front and center on the striking yellow cover art. Following the events of the previous two volumes, tensions are high in Ikebukuro. Two gangs–the Dollars, and the Yellow Scarves–each blame the other for a series of slashing incidents that were, in actuality, caused by the mysterious entity known as Saika. Those of you who read volume two should know who is at the head of each of these three groups… and who is the one pulling all the strings from behind the stage. If the first two volumes were about making all the wild reveals, then volume three is all about answering “So now what happens?” The roller coaster has passed its bumpy twists and turns, and now we’re at the loop da loop. The heart of this volume lies in Kida’s backstory. How did a happy-go-lucky fellow like him get roped up in all this craziness? His motivations are very easy to follow, and the regret he holds in regard to mistakes of his past is very easy to empathize with. Actually, he is probably one of my favorite characters in the series, because he’s basically just a regular boy who made a few–I’ll say human–decisions and as a result is in way over his head with the whole gang warfare scenario. Amid a cast of fantastic and larger-than-life figures, Kida comes off as the guy who jumps into a gunfight with just his fists. Meanwhile for the overarching plot of the series, we get a good amount of progress made for Celty, whom the author likes to remind readers in volume afterwords is the Durarara!! lead character. There are a surprising number of humorous moments with her and Shinra which I enjoyed, but more significantly we get some more plot development upon the arrival of Shinra’s father–a character who is as suspicious as he is comical. And he’s more or less a bizarre personification of The Dad Joke, so suffice to say he’s highly questionable. Considering all the nonsense Celty has to put up with day in and day out, I continue to find her an easy character to root for. ← Which Came First, the Bake or the Kizu?